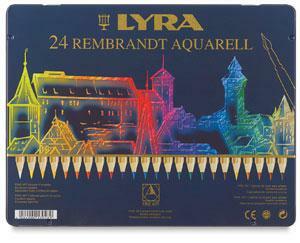 Lyra Rembrandt Aquarell watercolor pencils are made with only the finest quality pigments and are available in 72 distinctive shades. The pigments in the 4mm colored leads can be dissolved almost completely with water. The brilliance and lightfastness of the colors are of the highest possible standard. These pencils enable the user to achieve fine, exact contours, as well as brilliantly colored areas and delicate merges. Blending lines and shaded areas is achieved easily with a brush, cotton swab or Bending Stump dipped in water.